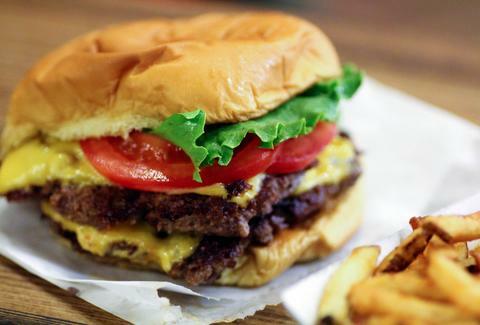 Nearly a year after first teasing the arrival of its cheeseburgers, crinkle cut fries, and concretes, Shake Shack has finally nailed down its opening date and location. As Eater reports, the famed NYC-based burger chain plans to open its doors on March 15th at the corner of Santa Monica Boulevard and West Knoll Drive. Yes, that's only two weeks from today. The new Shake Shack lands squarely within In-N-Out's greasy turf, and just a little more than 2 miles from the nearest In-N-Out restaurant, which means Angelenos will finally be able to settle the ongoing Shake Shack versus In-N-Out debate for themselves in just one trip. Additionally, the LA Shake Shack will feature the beer-and-bacon-fueled Roadside Double, made with beef patties, Swiss cheese, dijon mustard, and caramelized onions simmered in beer and bacon (and appears to be a new iteration of a limited edition burger released last summer), according to the report. But don't worry about trying to decide what to try first, as you'll have plenty of time to make up your mind in line. You might as well get in line now. Tony Merevick is Cities News Editor at Thrillist and can't wait to see all the Instagram shots of the line. Send news tips to news@thrillist.com and follow him on Twitter @tonymerevick.